Entertain in style with the dual-mount Vault bar sink. Handcrafted from premium quality stainless steel, this square sink is ideally sized for prepping drinks and appetizers, rinsing vegetables, and drying glassware. When installed as a top-mount sink, Vault offers an ultra-flat rim that makes it easier to wipe from the countertop directly into the bowl. An included bottom basin rack helps prevent scratches and keeps the finish looking new for longer. Pair this bar sink with other Vault sinks to bring a contemporary vibe to your kitchen. With faceted walls and a mirrored rim, Brinx reflects luxury and distinctive style. Fill this unique bar sink with ice for chilling wine, or prepare garnishes and appetizers with your guests nearby. The sinks small size conveniently tucks into a corner or leaves plenty of space on the counter for preparing food and serving drinks. Brinx is handcrafted from premium quality, 14-gauge stainless steel for exceptional durability and luster. A simple and convenient basin for kitchen islands and entertainment areas, this Gimlet bar sink features durable construction that resists chipping and a universal design that suits a wide range of decors. The petite size fits smaller spaces while accommodating a variety of bar, food preparation, and cleanup tasks. Entertain in style with the Porto Fino bar sink. Designed to simplify food preparation, the round shape and flat bottom make it easy to wash produce or clean glassware. Crafted from enameled cast iron, this sink resists scratching, burning, and staining for years of beauty and reliable performance. Vault 15 inch X 15 inch X 9.3125 inch Stainless Steel Bar Sink Entertain in style with the dual-mount Vault bar sink. Handcrafted from premium quality stainless steel, this square sink is ideally sized for prepping drinks and appetizers, rinsing vegetables, and drying glassware. When installed as a top-mount sink, Vault offers an ultra-flat rim that makes it easier to wipe from the countertop directly into the bowl. An included bottom basin rack helps prevent scratches and keeps the finish looking new for longer. Pair this bar sink with other Vault sinks to bring a contemporary vibe to your kitchen. 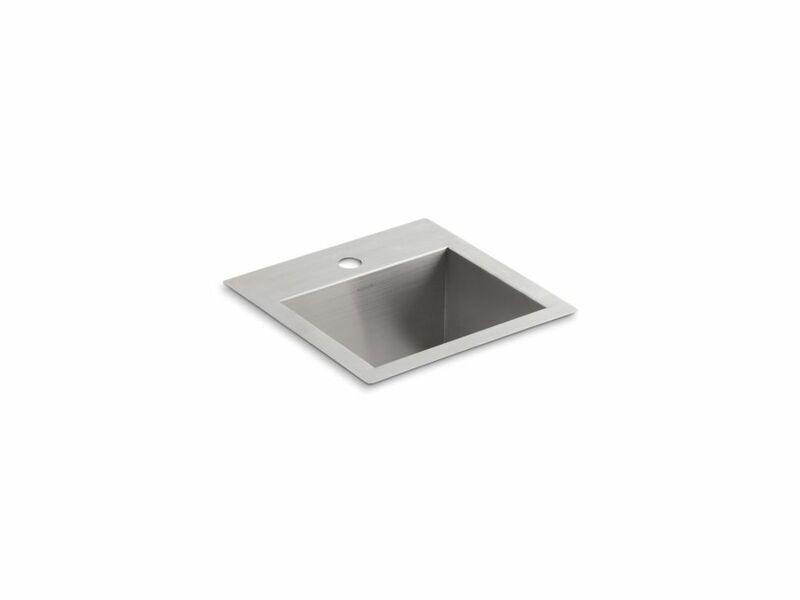 Vault 15 inch X 15 inch X 9.3125 inch Stainless Steel Bar Sink is rated 4.3 out of 5 by 3. Rated 4 out of 5 by John from I like the sink, but I did have a MAJOR problem with the installation. The sales literature shows... I like the sink, but I did have a MAJOR problem with the installation. The sales literature shows internal dimensions of 12-1/4 x 9-9/16. However when I received the sink and template, I found out that for a top mount, the hole needs to be 14-1/2 x 14-1/2. I was replacing an existing sink so my installer had to recut my granite countertop to widen the hole. Kohler should have provided a more prominent warning about the difference. Rated 4 out of 5 by Andrew from Very attractive product and looks great in the bar. ... Very attractive product and looks great in the bar. The only complaint that I have is that it is it has sharp edges around the flange that should be rounded off. It is advertised as being either for above or under countertop installation. If you purchase for above counter top remove sharpness. Rated 5 out of 5 by Lucy from Perfect prep-sink Simple styling, good quality and easy to install. I would recommend this item.